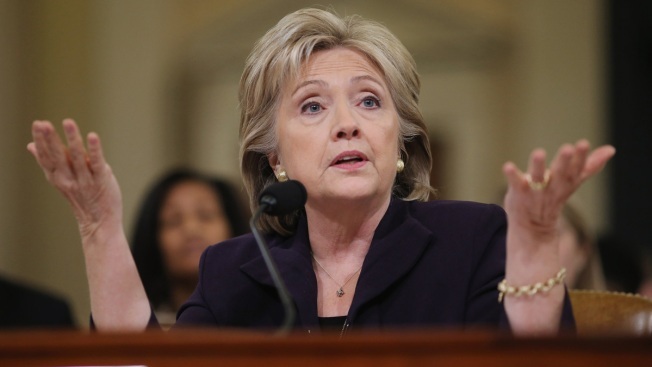 Democratic presidential candidate and former Secretary of State Hillary Clinton testifies before the House Select Committee on Benghazi October on Capitol Hill October 2015. Air Force Reserve Maj. Brad Podliska, a former investigator for the House Benghazi Committee, is dropping allegations that the committee unfairly targeted Hillary Clinton from his lawsuit against his former employer, NBC News reported. In his original suit against the committee, filed in November, the former Republican staff member alleged that he was terminated because he had to leave the committee for military reserve service and because he refused to "go along with the hyper-focus" on Clinton in the committee's investigation into the handling of the Benghazi attacks. While Podliska's lawsuit sought to address alleged employment discrimination, the explosive charge of bias against Clinton fed into partisan battles over House Republicans approach to the issue. That allegation is now gone — his amended complaint removes any reference to Clinton — effectively retiring that argument as a legal matter. The shift was first reported by Politico.